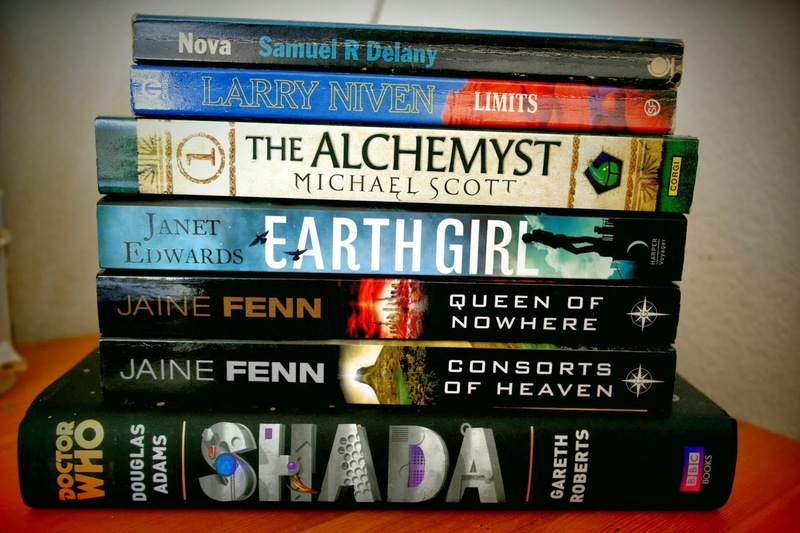 Just under a month ago, I went to a fantasy and science fiction convention not far from where I live, called BristolCon – and for today’s Sci-Fi Month post, I want to share my experience with you! Don’t forget to check out the schedule for the rest of today’s posts. You can also Tweet about the event using the hashtag #RRSciFiMonth. BristolCon is a one day convention, organised by the Bristol Fantasy & SF Society, and held annually. It gives those living in the south-west a chance to attend the sort of events we normally miss out on. 2013 was the fifth con, and it has grown from an afternoon to a full day of panels, stalls and other exciting events over the years. You can view the programme here. Guests this year included: Philip Reeve, Storm Constantine, Mark Buckingham, Sarah Ash, Paul Cornell, Janet Edwards, Jaine Fenn, David Gullen, Emma Newman, Ian Whates, Gareth L. Powell, David J. Rodger and many more. Several of the guests are actually taking part in Sci-Fi Month, which was particularly exciting! I went to the con with two friends of mine from university, and we started off by browsing the dealers room. The stalls ranged from Forbidden Planet selling books (many of which were signed; I purchased Earth Girl by Janet Edwards and Queen of Nowhere by Jaine Fenn to be signed later on), Crafty Miss Kitty who sells some wonderful jewellery including many Doctor Who themed pieces, PQ Vintage Sci-Fi who had a massive collection of vintage and secondhand sci-fi classics and various other stalls selling sci-fi books, memorabilia, costumes and more. You can view the list of dealers here. Then we thought we’d consult our programmes and work out which panels to attend. The first thing we knew we wanted to attend for sure were the book signings at 2pm (all authors at once!). 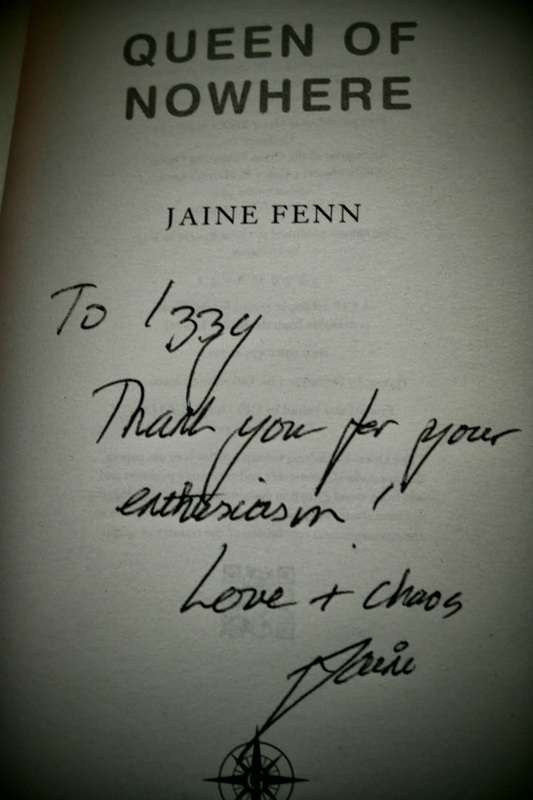 I knew I wanted to get my books signed by Jaine Fenn and Janet Edwards, so I made a beeline straight for them. Sadly Janet was nowhere to be found, but I met Jaine and introduced myself, and she was lovely! It was nice to meet someone I’d been speaking to online, and put a face to the ‘voice’ – but I have this horrible shyness around people I admire and once I’d introduced myself I had a bit of a brain freeze… anyway, I just want to take this chance now to say thank you to Jaine for taking part in the event! One of my friends had a couple of Philip Reeve‘s books, so she got them signed and they had a long chat! I’ve spotted several copies of his Mortal Engines in my local second-hand bookshop, and wish I’d picked at least one up to get signed, but never mind! 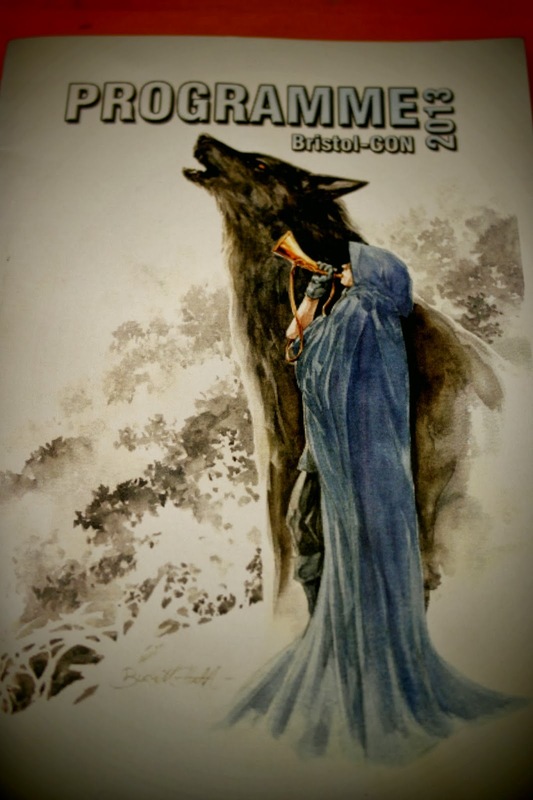 5pm brought with it a talk on ‘Magic in Fantasy’, moderated by Jonathan Wright and featuring Anne Lyle, Storm Constantine, Snorri Kristjansson and Paul Cornell. It was a fantastic talk on fantasy and magic systems, how different authors show magic and which systems we thought were the best. One person suggested the system used in The Name of the Wind, where magic is known as sympathy and requires a sacrifice, and I completely agree! Another brilliant talk followed, ‘Beyond Arthur’, which was a discussion on folktales and legends that often get ignored in fiction, moderated by Gaie Sebold and featuring Roz Clarke, Catherine Butler, Philip Reeve and Scott Lewis. They discussed many local legends, including variations on how the River Avon got its name (one being that a lady named Avona drowned herself in it after spurned love). 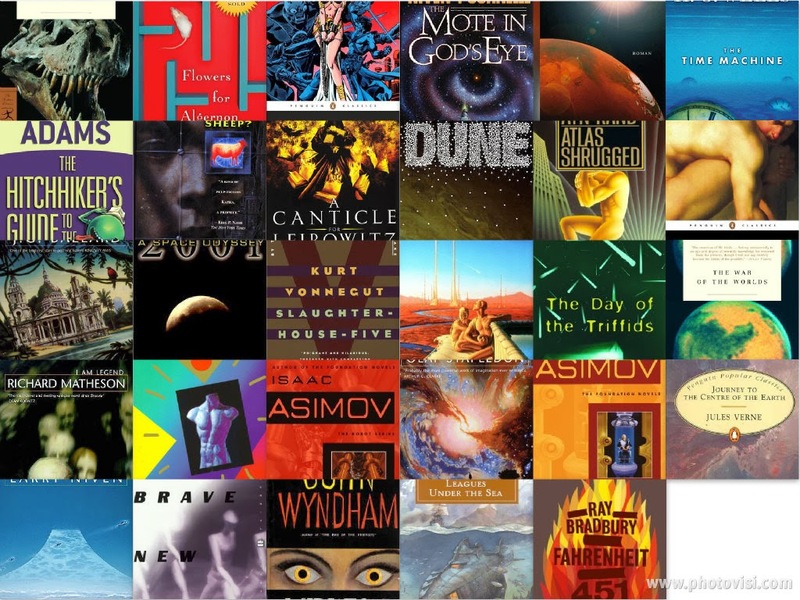 It was at this point that I also bumped into Colin, who runs Clarion Publishing, and has been a major help for Sci-Fi Month – he is the one who put me in touch with so many of the authors taking part, so thank you so much Colin! Our next plan was to head to the quiz (we love quizzes!) which wasn’t until 8.30pm, so we hung out in the bar for the next few hours and just chatted about the day. Whilst we were sat in there I finally spotted Janet Edwards, and managed to grab her just before she left! I explained that I was the one organising Sci-Fi Month, and she told me all about Nara’s interview and one particularly evil question that Nara posed for her! She was lovely and didn’t mind at all that I sort of grabbed her on her way out. And I got my book signed, yay! And then finally, the quiz! Hosted by Nick WaIters (who has written some Doctor Who novels), it was really fun and a brilliant laugh – me and my two friends had our own team and we did SO badly (we got a grand total of 19 but actually were the losers only by 1 point…). There was an entire round on William Shatner. We know nothing about William Shatner. The round we did really well on? Cats on film. It was a picture round and we had to identify which films the cats were from – Jonesy from Alien, one of the Bond cats etc. We’d been laughing along with the team next to ours, who marked our quiz sheet (sure to draw more laughter), and it turned out one of the members was Ian Whates, who is taking part in Sci-Fi Month! Anyway I introduced myself and he was absolutely lovely. He was very impressed with our feline knowledge. And that was the end of the con! We arrived back at my friend’s house just after 11pm, a brilliant day only slightly hampered by a constant migraine… And the next day, we went to Bristol Museum (we’re all archaeology graduates so of course) and bumped into Philip Reeve in the museum cafe, as you do (tea and cake were sorely needed). He even recognised us! The Alchemyst by Michael Scott – this was our freebie book in our goodie bags, and the author kind of makes me giggle because I’ve been watching a lot of The Office US lately (if you’ve not seen it, Michael Scott is the boss, the character played by Steve Carrell). But it does sound good, it’s about Nicholas Flamel! 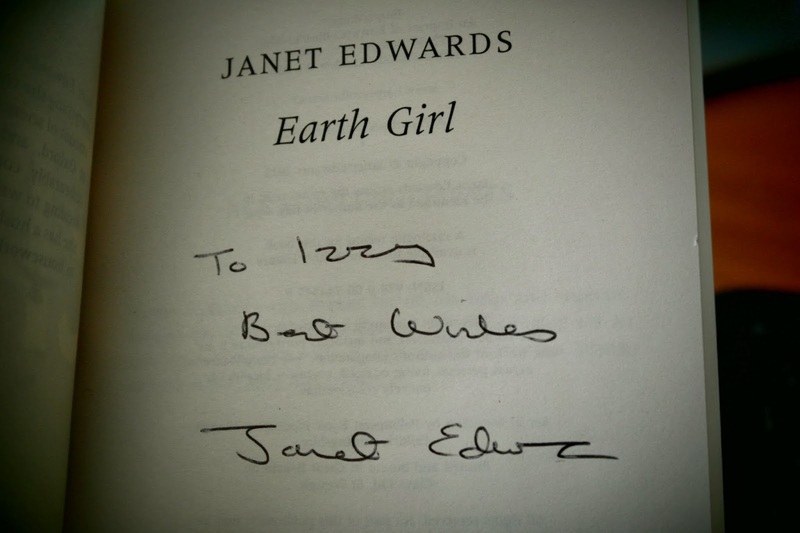 Earth Girl by Janet Edwards – this one has been very highly praised, and Janet is even taking part in Sci-Fi Month. You can win a copy of this one over on Nara’s blog, and read an interview with Janet herself! 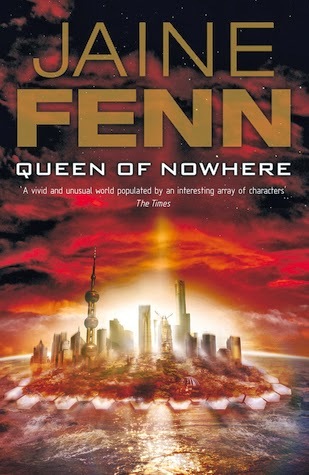 Queen of Nowhere and Consorts of Heaven by Jaine Fenn – I picked Queen of Nowhere up at the con, and got it signed (see above), but didn’t pick up Consorts of Heaven until the next day (at the £2 Book Shop, it is HEAVEN) so couldn’t get that one signed, sadly! I first encountered Jaine’s writing last year and was really impressed by it. Doctor Who: Shada by Gareth Roberts and Douglas Adams – my other £2 Book Shop find, I’ve been wanting to read one of the Classic Who novels for a while and this seemed like a great one to start with. 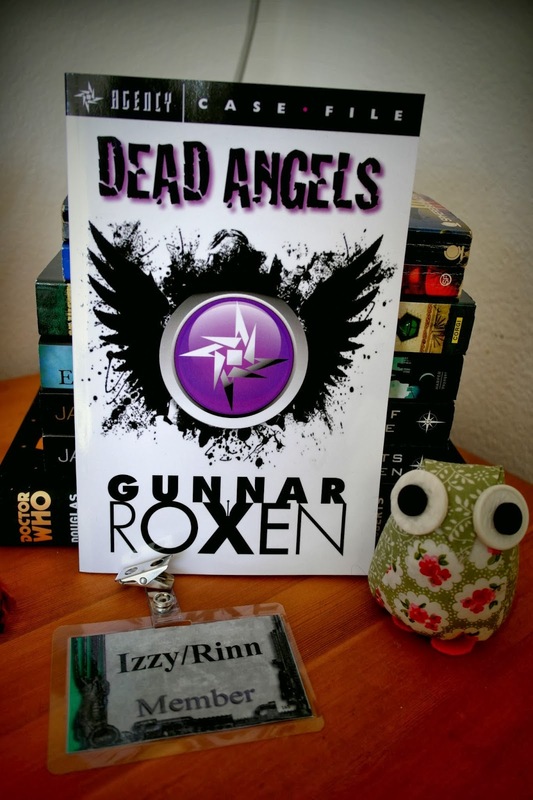 I also picked up a copy of Dead Angels by Gunnar Roxen, a very friendly author who was at the con. It’s a short novella so I thought it would be a good way of checking out his work. I also got a little fabric owl (I have an owl collection that has mostly come from other people buying me owl stuff ever since I bought an owl bag and matching purse…), and you can see my con badge in the photo too!